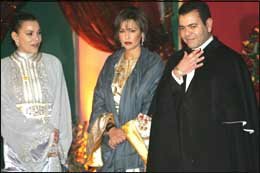 Marrakech---HRH Prince Moulay Rachid, who presided over a dinner offered by HM King Mohammed VI in honour of figures of world cinema on Saturday, said that the fifth Marrakech International Film Festival (FIFM) 'has become a love meeting between a magical city and a devoted art'. The Prince, who was accompanied by Their Royal Highnesses Princesses Lalla Meryem and Lalla Hasna, also highlighted the importance of cinema in bridging cultures. At the dinner ceremony, guests were called to observe a minute of silence for Abderrahim Bouâlem and Abdelkrim El Mouhafidi, the two Moroccan employees of the Rabat embassy in Baghdad, who were kidnapped in Iraq last month. The opening ceremony of the Marrakech International Festival, currently being held in Morocco's red city between Nov.11-19, was marked by a special tribute to the Moroccan-born actor Hamidou Benmassoud, alias Amidou, and the US Director Martin Scorsese. He explored the world of Cinema thanks to French Director Claude Lelouch who gave him major roles in many of his films. He has also worked overseas along with outstanding and famous Hollywood actors including Brad Pitt, Silvester Stalone, and Michael caine. The opening of the event was marked by the screening of Stephen Frears' musical comedy, “Mrs. Henderson presents”. This year's festival will feature 124 films, 16 in competition, including 10 first or second features, from 15 different countries. The “carte blanche” is given to Yash Chopra, one of the hippest and trendiest directors of Indian cinema.